A couple of weeks ago I talked about how to keep your house clean and suggested you should make a habit of putting things back where they belong after using them. Are you familiar with the word “habit”? A habit is something you do often and regularly, sometimes without even knowing that you are doing it. Now, speaking of a habit, have you heard of 21-day rule? Some people believe it takes 21 days to form a simple habit. In other words, if you stick to something for three consecutive weeks, you’re more likely to achieve your goals. I can’t tell whether it’s a myth or fact. But kaori and I will be very happy if you make it a habit to come visit our website or facebook page every day. That in turn should help you make a habit of studying English every day. Anyhow, let’s learn this sentence for now. Would you like to repeat after me? 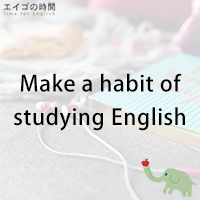 Make a habit of studying English every day. Next Post ニトスキって知ってる？ – Have you heard of Nitosuki?